Long Islanders know it doesn’t have to cost and arm and a leg to have fun locally. There are plenty of exciting free activities taking place year-round on Long Island, and the beautiful scenery beckons visitors by the thousands to our shores, parks and main streets. We have dozens of suggestions for fun free things for you to do. Whether you are interested in sports, musical performances, fairs and festivals of all shapes and sizes, a relaxing walk along a wooded path or a simply a new picnic spot, we can help you find the perfect free fun activity your are looking for! If you find yourself sitting idly and wishing for something to do on Long Island, look no further than the guide below. Long Island has a wealth of public beaches to explore. Whether you want to dip your toes in the water or watch the sunset over the sandy beaches, parking is free before Memorial Day and after Labor Day, and typically after 5 or 6pm throughout the year. There are tons of great free events happening on Long Island throughout the year. From concerts, to nature hikes, family fun, festivals, and everything in between, there's tons of unforgettable fun that won't cost you a dime happening right here on Long Island! Long Island’s towns put on a series of live music, outdoor summer shows all across Long Island; for example, the town of Nesconset uses a local town park, and has had some great shows covering legendary rock bands like The Rolling Stones, Queen and The Police. Other towns offering FREE outdoor summer concert series include Glen Cove, Lindenhurst, Deer Park, North Hempstead, Long Beach, Smithtown, Montauk, Northport, Oyster Bay, Sag Harbor, Sayville, Southampton, Stonybrook and Westbury Square, to name just a few. Long Island has many port, waterfront and historical towns to explore. It’s FREE to walk the boardwalks in Long Beach and Freeport or enjoy a beautiful day walking around waterfront towns such as Northport, Port Washington, Cold Spring Harbor and Port Jefferson. Some towns offer museums and the chance to explore the local heritage and history of the area. Stony Brook’s Grist Mill tour is only $2 per adult and $1 per child; call (631)751-2244 for more information. Exploring a new town can be fun and an inexpensive adventure for the whole family. The Nassau County Museum of Art in Roslyn Harbor is FREE of charge on weekdays and a mere $2 parking fee on weekends. Other free museums include Stony Brook’s Museum of Natural Science, the American Guitar Museum in New Hyde Park, and The African American Museum and Center of Education and Applied Art in Hempstead. Nassau and Suffolk County alike are both home to lush botanical gardens and arboretums which are often free to stroll around in. Take a walk through the 40-acre property of the Bailey Arboretum in Lattingtown, or take a look at the hundreds of species of trees and plants at the Bayard Cutting Arboretum in Oakdale. At the Cutting Estate, you can also lounge in Adirondack chairs and look over the beautiful grounds. There are many festivals all over Long Island, notably Montauk’s Annual Music Festival. This festival is generally held in the middle of May and is FREE of charge. Click here for the website and schedule. Another excellent event is the Long Beach Jazz Fest typically held in September; Click here for the website and schedule. Zoos and Animal Preserves: The town of Brookhaven Ecology Site, Park & Animal Preserve offers a petting zoo with FREE admission and is open from 9 a.m. to 4 p.m., seven days a week. One can also take a ride over to Sweetbriar Nature Center in Smithtown to see domestic and wild native and non-native birds, mammals, amphibians, reptiles, and more, all for free! Grumman Memorial Park is FREE and open daily to the public from 9 a.m. to 5 p.m. (weather permitting.) Located on Route 25 in Calverton, NY, the Grumman Corporation (now the Northrop Grumman Corporation) has had been an integral part of the history of the area and is located on the former Grumman Aerospace Flight Test Facility in Suffolk County. Hiking trails are abundant on Long Island, and due to the flat terrain, they are accessible for all ability levels. These paths traverse sandy beaches, glacial morraines, maritime forests, and even inland lakes. If you're in need of some motivation or guidance, there are also plenty of hiking clubs to join to get out and get moving. Long Islanders are lucky to be right in the middle of the migrations of many creatures, including the migration of several species of seals in the winter, and the monarch migration in the Fall. There are also birdwatching groups in the area that you can join, or just go to one of these great birdwatching locations to see some neat songbirds and birds of prey. One of the most valuable way to spend your time without spending your money is to volunteer a helping hand to others. Try taking care of cats and dogs at your local animal shelter, or visit a veteran's home and spend time speaking with those who may not have many visitors. Check out our seasonal guide for year-round fun on Long Island! for even more of the best local activities and entertainment, check out our Things To Do Guide! 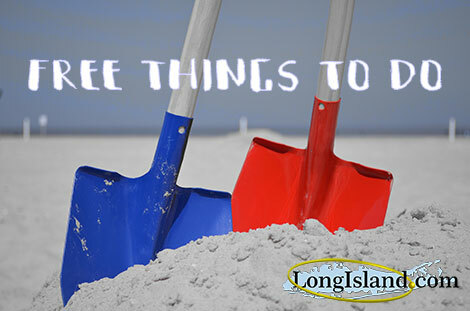 Or, send us an email about your favorite free things to do on Long Island!